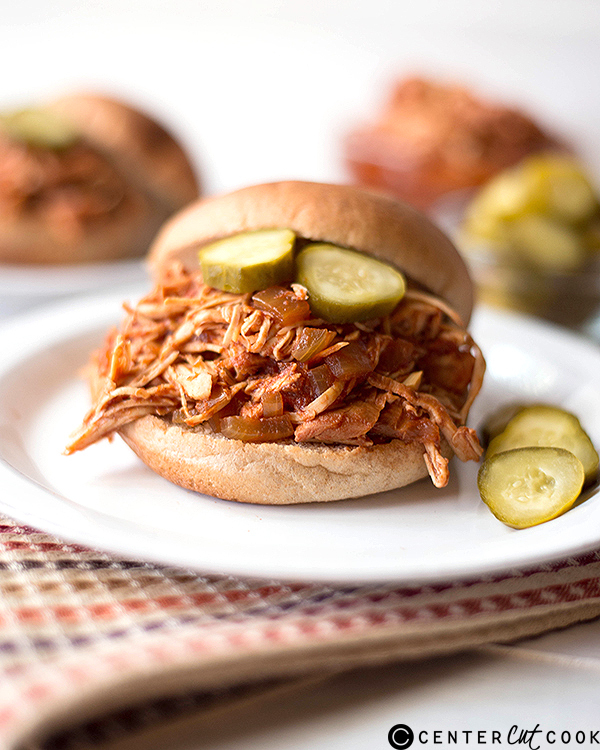 A healthy new take on an old classic: Slow Cooker Skinny Chicken Sloppy Joes. Growing up, we never had Sloppy Joes. I remember thinking Sloppy Joes were just something those “normal” families had that we just didn’t for whatever reason. Apparently, we weren’t “normal” and that was just how things were. Then, life went on and I became a mother with three kiddos of my own who had never had a Sloppy Joe. Dustin randomly asked me to make Sloppy Joes the other day. So, of course, the kid in me jumped at the chance. I made them using a slow cooker…but I made them healthy! And they came out deliciously. The combination of the sweet chicken with the dill pickle is so delicious. Kids and parents, rejoiced! Dustin, who grew up on Sloppy Joes (he’s one of those normal people), said these Slow Cooker Skinny Chicken Sloppy Joes were even better than he remembered the original from growing up. Because who needs to be totally normal, anyways? Combine the chicken breasts, kosher salt, onion, garlic, Worcestershire sauce, tomato sauce, tomato paste, coconut sugar, and chicken stock in the bowl of a slow cooker. Cover and cook on Low for 4-5 hours, or until the chicken is cooked through and the onions are tender. Using two forks, shred the chicken in the juices until evenly shredded. 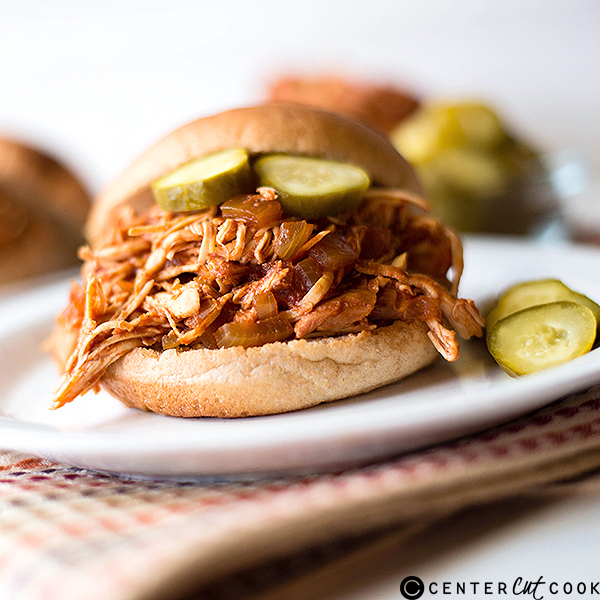 To serve, pile the shredded chicken on the bun and top with sliced dill pickles, if desired.